Allows RF systems to be designed more quickly and accurately. AGILENT Technologies has added a budget analysis capability to its advanced design system (ADS) 2004A electronic design automation (EDA) software. This allows RF systems to be designed more quickly and accurately. The software predicts RF system performance by considering specification tradeoffs earlier in the design cycle. In the past, RF design budgeting was achieved mainly through spreadsheet-based analysis, a time consuming and often cumbersome process. 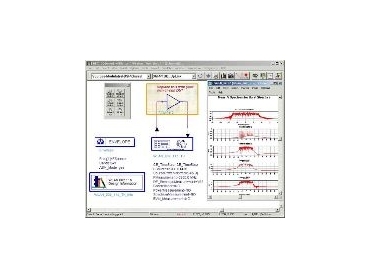 Agilent ADS software offers a set of front-to-back simulation and layout tools and instrument links for RF and microwave IC design in a single, integrated design flow. The budget analysis feature supports multiple hierarchy and transistor-level subnetworks, allowing system and circuit designers to analyse designs in a single environment using a wide range of system and circuit components. It provides an intuitive interface for setting up simulations and for selecting from more than 40 built-in measurements for analysis of two-port network topologies. Budget analysis measurements include signal, noise and system chain, and nonlinear measurements such as third-order intercept point. Complex systems such as automatic gain control (AGC) loops also can be analysed using budget analysis. The results of the selected measurements can be displayed in plots and tables or exported as an ASCII text file for use with external spreadsheet software.